This is the story of a perfect wedding day. 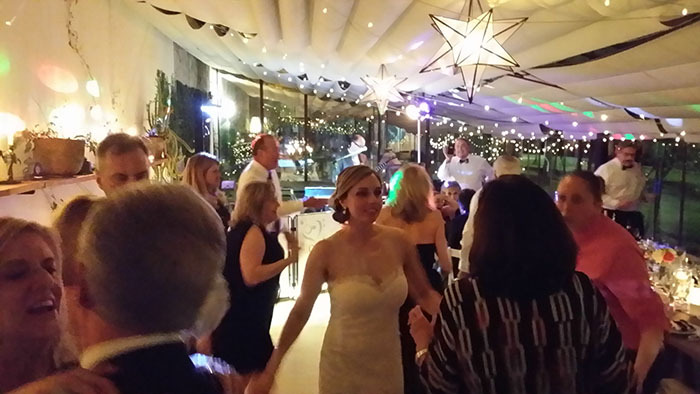 A beautiful couple from the USA, a beautiful Farm Holidays in Lucca and an amazing Tuscany wedding band. A sunny and nice couple from California – USA having their wedding reception in Tuscany. The ceremony takes place in the garden (The venue is set in fifty acres of olive groves), the aperitifs in front of Casa Maria, the dinner and the dancing take place inside the greenhouse nearby. Farm Holidays and B&B Fattoria Mansi Bernardini is the perfect location for the greatest day of your life, the views are to die for and is set high up on the hills overlooking Lucca. The accommodation is made up of a number of different houses and apartments and they all had character;it is ideal for holding your wedding here as it’s nice for all the guests to spend a few days together before and after the wedding. The staff is very helpful, Monica and Marcello are the best for organizing a beautiful and smooth event in a magical location. It is also a nice place to stay on holiday as you are in easy reach of Pisa and Lucca. The fattoria produces an excellent extra virgin olive oil that is sent all over the world. Beautiful venue, amazing food, a fantastic wedding, an American couple and guests from all over the world! !, Live music, DJset and karaoke facility are provided by the Tuscany wedding band Guty & Simone, the Italian wedding musicians and DJ!! Watch the videographer video trailer of the day here!